Assess key outcomes of Indian Prime Minister Narenda Modi’s recent visit to Israel. To appreciate the full significance of Modi’s visit, one has to know the history of Israel-India relations. Reluctantly, India recognized Israel on September 18, 1950, the fifth Asian country [to do so], but, because no full diplomatic relations were approved for over 40 years, Israel was unofficially represented by an honorary consul in Calcutta. Yet, the two countries maintained backdoor relations, which included Israeli military shipments following the 1962 Sino-Indian confrontation. Because of its rivalry with Pakistan, substantial Muslim population, and dependence on Arab oil, India preferred to hide these relations. In fact, India, and Asia in general, had not been that important for Israel before the early 1990s. By that time, India could no longer fall behind China, which set up relations with Israel and thereby facilitated its breakthrough to Asia. Since then India’s relations with Israel have prospered, with India becoming Israel’s leading arms market and a substantial economic partner. Yet, no Indian leader had dared set foot in Israel until Modi’s arrival. Needless to say, scores of framework agreements were signed but because military and economic relations have been going on anyway, and because India has hardly changed its political orientation and association with the Arabs and the Palestinians, the main outcome of the visit, and still the most significant, was symbolic. What is the potential impact of closer Israeli-Indian strategic cooperation on China? Little impact, if any, is expected in politics since both China and India still side with the Arabs and the Palestinians and have hardly supported Israel in international organizations. It may affect military relations. Under U.S. pressure, Israel was forced to stop arms sales to China, following which India has become its main client. Fully aware of these military transactions, Beijing has usually and publicly kept quiet about it and failed to criticize Israel. Actually, Israel’s arms sales to India have legitimized China’s arms sales to Iran and other Middle Eastern countries. However, there are indications that Beijing is beginning to take the Indian threat more seriously than before, which means that the Chinese may become more sensitive to the Indo-Israeli military nexus and, therefore, apply pressure on Israel to stop or restrict arms shipments to India. Beyond this, India becomes a significant player in the trilateral economic competition. 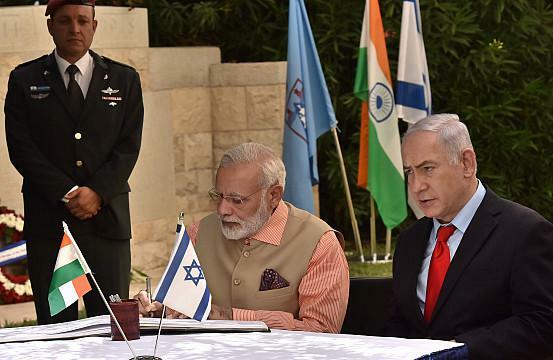 What factors precipitated the shift toward stronger relations between India and Israel? Initially, it was Beijing’s decision to establish diplomatic relations with Israel, as well as the Soviet collapse, which had driven India to establish official relations with Israel. They have been given a boost over the last few years by India’s realization that politics could be separated from economics; governments could continue supporting the Arabs and the Palestinians and still enjoy good technological and economic relations with Israel. Also, the virtual disintegration of the Arab Middle East; the never-ending conflicts and confrontations; and the emergence of Islamic radicalism and terrorism (that have also affected India), underline Israel as a democratic island of stability and as a source of mutually beneficial cooperation. For Israel, India represents a huge economic and military market that, together with China, offers Israel access to nearly half of the world population, which had been beyond its reach before. As Beijing enhances China’s leadership role in the Middle East, and Israel strengthens ties to India, what is Israel’s strategic calculus? Unlike most observers, I don’t think that “Beijing enhances China’s leadership role in the Middle East,” definitely not in political terms. Beijing is still careful to avoid becoming involved, least of all mediate, in regional conflicts. Its participation in UN peacekeeping forces, special envoy to the Middle East, evacuation of Chinese nationals from conflict zones (Libya, Sudan, Yemen), and cooperation in anti-piracy operations, do not reflect greater involvement, let alone leadership, and still indicate a low profile and limited commitment. In fact, these triangular relations (Israel, China, India) are predicated on the assumption of little external intervention in the conflict. In this respect, Jerusalem’s strategic calculus – implicitly shared by India and China – is to pay lip service to politics (including the absorption of anti-Israel votes in international organizations, which are mostly meaningless anyway) and gain trilateral benefits from economic and military relations. Explain the U.S.-Israel dynamic in the Israel-China-India nexus. Willingly or not, Israel is heavily dependent on the United States, for better or worse. Israel’s military transfers to China began in the late 1970s, with Washington’s knowledge, approval, and perhaps encouragement. Israel served as a convenient proxy to make Beijing stronger against Moscow, which warned the U.S. not to arm China. Yet, following the Soviet collapse China, no longer an unofficial ally, has become a “threat.” Israel was now forced to stop providing China with arms and military technology and this prohibition has affected much of Israel’s civilian (or dual-use) hi-tech exports to China. Today, the U.S. is the main obstacle to expanding Israel’s relations with China. No such U.S. limitations apply to India. Put differently, the future of Israel-China relations depends to a great extent on the future of U.S.-China relations. Beijing is fully aware of Israel’s predicament and of the inconceivable cost Israel would have to pay for resuming military relations with China.